Solar Control Window Film Market Holds Growth Of $849 Million By 2024: Grand View Research, Inc. 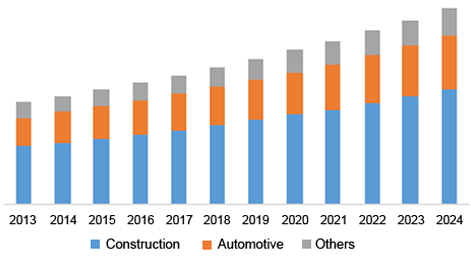 The global solar control window film market is projected to reach USD 849.2 million by 2024, according to a new report by Grand View Research, Inc. Growing construction and automotive industries are expected to fuel the growth of the solar control window films industry. Solar control window films are installed on windows of buildings and vehicles in order to block harmful IR and UV rays. Installation of these films helps restrict the use of air conditioners which, in turn, lowers the emission of harmful gasses from these appliances. The construction segment dominated the market in terms of application in 2015. It accounted for 57.4% of solar control window film market in 2015. Growing construction activities in the Asia Pacific and MEA are providing the necessary momentum to the growth of the market. Regulations regarding energy consumption and conservation particularly in commercial buildings have further increased the demand for solar control window films. Among applications, the construction segment held the largest share and is projected to grow at the highest CAGR of 6.2% during the forecast period. Increasing construction spending, especially in emerging regions such as Asia Pacific and MEA is expected to drive this segment over the forecast period. The construction industry in the U.S. has witnessed an upward surge, which has further increased the demand for the product in this segment. Vacuum coated films are projected to grow at the highest rate of 6.1% from 2016 to 2024, owing to their ability to block the fatal UV rays effectively. The metal content in these films reflects the sun rays and keep the interiors of buildings and vehicles cooler and prevent them from fading, making them more popular than dyed and clear films. Asia Pacific was valued over USD 170 million in 2015 and held the largest share in the global market. It is also projected to be the fastest growing region from 2016 to 2024, with a CAGR of over 6% courtesy growing construction and automotive industries. Emerging countries such as India, South Korea, and Indonesia have witnessed tremendous growth in both, construction and automotive sectors. Also, as the weather in this region can get hot and humid, particularly during summer, it is imperative to shield buildings and vehicles with solar control films. The market is dominated by key players such as Saint-Gobain SA (France), 3M Company (U.S.), Garware Polyester Limited (India), and Eastman Chemical Company (U.S.). Apart from these, several small and medium scale players are present in the market. These companies, through R&D and strategic developments, aim to increase their market shares. New product development was the most popular strategy adopted by these players, which helped them expand their current product portfolio.